In her collection The Weather in Normal, Carrie Etter laments the loss of her hometown of Normal, Illinois through the death of her parents, the sale of the family home, and the effects of climate change on Illinois’ landscape and lives. The author’s restlessly inventive use of multiple tones, shifting line lengths, and fresh turns of phrase are as much a means of conveying complex and paradoxical emotions as they are a determined formal strategy to avoid cliché. Shortlisted for the Ted Hughes Award for New Work in Poetry for her last collection, Imagined Sons, Etter has built a following based on her highly original and deeply emotive poetry. Carrie Etter lived her first nineteen years in Normal, Illinois, before taking a one-way train to Los Angeles. While living in southern California, she founded and edited Out Loud: The Monthly of Los Angeles Area Poetry Events and pursued her BA in English at UCLA and MFA in creative writing and MA and PhD in English at the University of California, Irvine. She moved to England in 2001 and began teaching in 2004 at Bath Spa University, where she is a Reader in Creative Writing. She has published three previous collections of poems: The Tethers (Seren, 2009), winner of the London New Poetry Prize for the best first collection published in the UK and Ireland in the preceding year; Divining for Starters (Shearsman, 2011); and Imagined Sons (Seren, 2014), shortlisted for the Ted Hughes Award for New Work in Poetry by The Poetry Society. She also edited Infinite Difference: Other Poetries by UK Women Poets (Shearsman, 2010) and Linda Lamus’s posthumous collection, A Crater the Size of Calcutta (Mulfran, 2015). 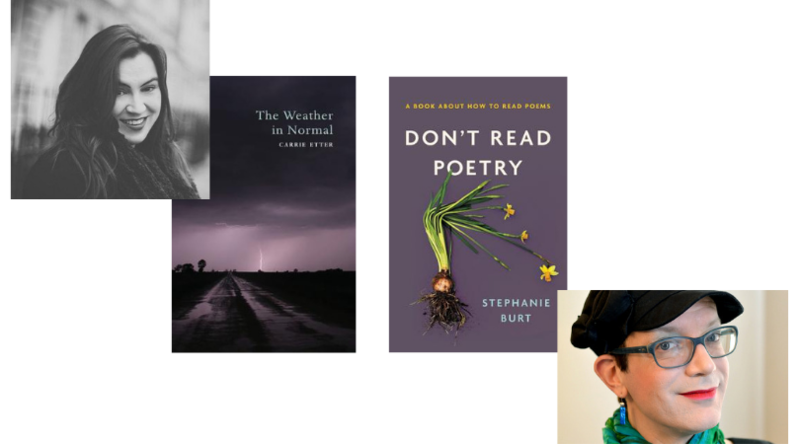 In Don't Read Poetry, award-winning poet and literary critic Stephanie Burt offers an accessible introduction to the seemingly daunting task of reading, understanding, and appreciating poetry. Burt dispels preconceptions about poetry and explains how poems speak to one another--and how they can speak to our lives. She shows readers how to find more poems once they have some poems they like, and how to connect the poetry of the past to the poetry of the present. Burt moves seamlessly from Shakespeare and other classics to the contemporary poetry circulated on Tumblr and Twitter. She challenges the assumptions that many of us make about "poetry," whether we think we like it or think we don't, in order to help us cherish--and distinguish among--individual poems. A masterful guide to a sometimes confounding genre, Don't Read Poetry will instruct and delight ingénues and cognoscenti alike. In her collection The Weather in Normal, Carrie Etter laments the loss of her hometown of Normal, Illinois through the death of her parents, the sale of the family home, and the effects of climate change on Illinois’ landscape and lives.